LOS ANGELES, CA and SCOTTSDALE, AZ--(Marketwired - March 30, 2016) - Mayo Clinic and vMocion, LLC, an entertainment technology company, today announced it is making available Mayo Clinic's patented Galvanic Vestibular Stimulation (GVS) technology specifically for use in virtual reality and augmented reality. 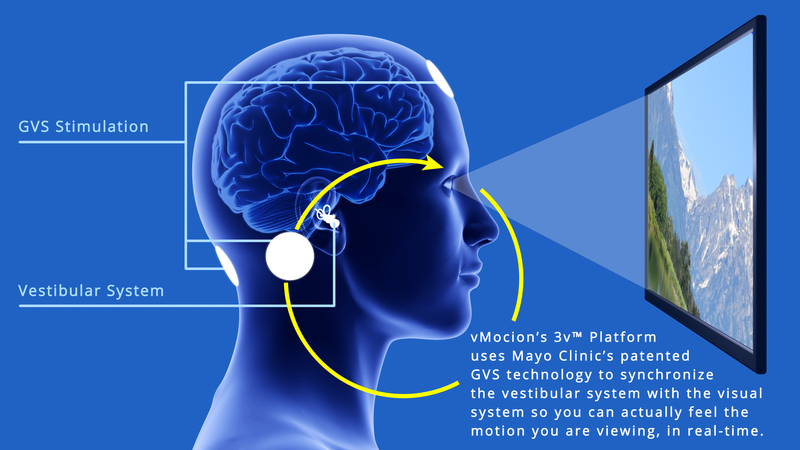 vMocion's 3v™ Platform (which stands for virtual, vestibular and visual) incorporates this patented GVS technology, which adds a complete sense of three-dimensional movement for the first time into a virtual reality or augmented reality environment. vMocion has been granted the exclusive, global, perpetual license for Mayo Clinic's GVS patents and algorithms within all media and entertainment categories and will offer the 3v Platform to other media and entertainment companies through a licensing agreement. "This is the first fundamental technological development in entertainment in 100 years since the combination of sound and pictures," said Brad Hillstrom, M.D., chairman of vMocion. "By adding this magical sensation of motion in gaming, movies, amusement parks and other entertainment environments, our 3v Platform is enabling a whole new dimension of motion that creates a truly immersive experience well beyond the current virtual or augmented reality technology offerings." Mayo Clinic's patented GVS technology, grew out of decade-long medical research by its Aerospace Medicine and Vestibular Research Laboratory (AMVRL) team, which consists of experts in aerospace medicine, internal medicine and computational science, as well as neurovestibular specialists, in collaboration with Vivonics, Inc., a biomedical engineering company located outside of Boston. The technology is based on work supported by the grants from U.S. Army and U.S. Navy. By stimulating the body's vestibular system (located in the inner ear), GVS produces a real-time sense of motion based on what a user is seeing. vMocion's 3v Platform uses GVS to produce a sense of motion that includes all three dimensions of movement -- left-to-right rotation, forward and backward motion, and side-to-side motion. In addition, given that the 3v Platform synchronizes the vestibular and visual fields within one-tenth of one second, it also eliminates VR sickness in most people. "Our research has proven that GVS can mitigate simulator sickness among pilots," said Michael Cevette, Ph.D., co-director of Mayo Clinic's AMVRL. "What makes this technology unique is that we have found a way to synchronize the inner ear stimulation with what people see visually on a movie screen or a gaming device, so they actually can feel the motion that they are seeing in real time." Jan Stepanek, M.D., AMVRL co-director, also added, "While this particular technology was licensed to vMocion for the media and entertainment industries, it's rooted in medical research, and the potential medical applications for GVS are also very exciting. For people with balance disorders, like vertigo, GVS technology could work with the patient's inner ear to help restore balance. With today's aging population, this technology has the potential to enhance balance and with that, decrease that risk." vMocion's 3v Platform features software that can be integrated into existing operating systems, and added to existing devices such as head-mounted devices, smartphones, 3-D glasses and TVs. vMocion will offer the 3v Platform through license agreements to select strategic partners who can bring this immersive experience directly to consumers. "Imagine watching a movie about flying, but then actually feeling the sensation of soaring above the landscapes. Or, imagine playing a virtual reality video game where you sense that you're actually running along with the character on the screen even though you're sitting in a chair in your living room," says Bradley Hillstrom Jr., CEO of vMocion. "These are just a few of the exciting ways that vMocion's 3v Platform will revolutionize the media and entertainment industry." The technology is based on work supported by the U.S. Navy under Contract Nos. N68335-07-C-0443, N68335-08-C-0294 and N68335-10-C-0119, and the U.S. Army under Contract No. W56HZV-11-C-0036. The 3v Platform integrates Mayo Clinic's patented Galvanic Vestibular Stimulation (GVS), which is a proven technique for stimulating the balance system of the inner ear to produce and control the sensation of motion. When the inner ear is stimulated and then synchronized with what a person sees visually on a movie screen or gaming device, one can actually sense the motion they are seeing in real time. For an animation of how 3v Platform works, visit http://www.vMocion.com/technology.html. vMocion, LLC (http://www.vMocion.com) is an entertainment technology company based in Los Angeles that holds the exclusive global perpetual license for the Mayo Clinic's Galvanic Vestibular Stimulation (GVS) patents within all media and entertainment categories. The company was formed by Hillstrom Media Technology, LLC and Mayo Clinic to create vMocion's 3v™ Platform, which can be licensed and integrated into a variety of media and entertainment applications, including virtual reality and AR platforms. This is vMocion's Logo. For more logo options, please visit http://www.vMocion.com/press.